The front garden can sometimes be a poor relation to the back garden, with less money and time spent on it. However a beautiful front garden can really welcome you home at the end of the day, and it can of course increase your house’s kerb appeal, and even its value. According to Phil Spencer (Zoopla May 2017), sprucing up the front of your house can add up to £5,000 to the value of your home. 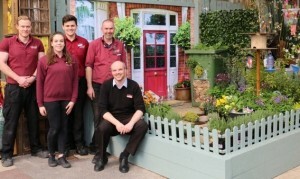 To show people what a difference a delightful front garden can make, Squire’s Garden Centres held a competition for each of their centres to design a small front garden that is attractive as well as environmentally friendly. Called “Welcome Home” the aim of the competition was to inspire customers with simple, cost-effective and creative ideas that could be easily replicated in their own front garden. Colin Squire and his daughter Sarah, Squire’s Chairman and Deputy Chairman respectively, judged the competition, with Squire’s in Badshot Lea winning the “Best Focal Point” award, while Squire’s in Long Ditton won the “Most Environmentally Friendly” award. Squire’s in Badshot Lea won the “Best Focal Point” award as they created a front garden that was warm and welcoming, as well as being environmentally friendly. It had lots of nice touches such as bay trees either side of the front door, a bug home in the bin, fragrant plants such as lavender to attract bees, a bird feeder, and above all, it’s a low cost and low maintenance front garden. Squire’s in Long Ditton won the “Most Environmentally Friendly” award as they created a front garden that was great for wildlife as well as being attractive to come home to. The quirky hanging “bee” baskets either side of the front door gave the garden a real sense of personality. A living roof on the porch adds greenery and will attract wildlife, as will the birdbaths and two log stack bug hotels. The whole garden has a calming green and purple colour theme, which is relaxing and welcoming.